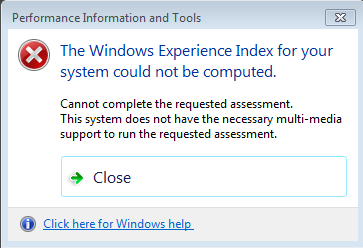 To enable the Aero UI enhancements in Windows 7, you must "rate" your computer using the Performance Information and Tools panel. If you receive the error: "This system does not have the necessary multi-media support to run the requested assessment", you may not have Windows Media Player installed (especially if you are running Windows 7 N). Download and install Windows Media Player at http://www.microsoft.com/windows/windowsmedia/download/AllDownloads.aspx and try again.